A device that lifts and secures lawn tractors to allow easy undercarriage maintenance is available from MoJack. 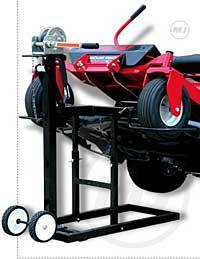 The adjustable lift is constructed of solid tubular steel and is designed to fit any size of lawn tractor or riding mower, including zero turning radius models. It has a lifting capacity of 400 pounds and triple-redundant safety jacks and pins, a non-slip, self-braking winch and sturdy jack stands. It’s built from 1 3_4 inch and 2 inch 11-gauge steel tubing and provides up to 24 inches of clear working space.